A blog dedicated to the summer Justice Brandeis Semester programs. 2017 JBS Programs have been announced! Summer 2016 JBS Applications are now OPEN! 2016 JBS Programs have been announced! Taking advantage of the weather to tell stories outdoors! Storytelling as Social Practice begins with the simple yet powerful observation that stories are a fundamental way of understanding and communicating with the world. Juxtaposing short-story analysis and narrative theory with the craft of creating and telling various types of stories, in this JBS theory enhances practice and vice versa. A day might ask students to read classic works of the short-story genre in the morning–like Edgar Allen Poe and Flannery O’Conner– and workshop autobiographical stories in the afternoon. 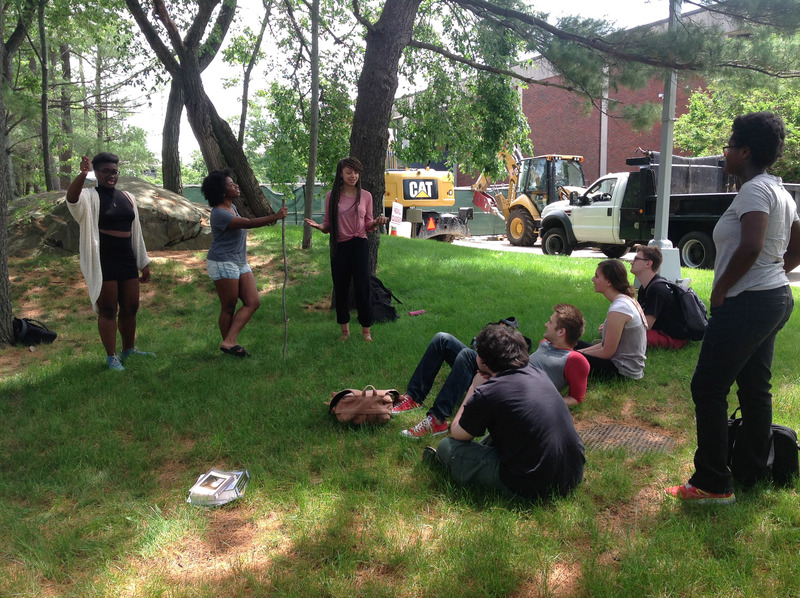 As the storytellers sharpen their reading and telling skills, Brandeis may have a new and articulate group to add to its story. This week, the Bio-Inspired Design course reviewed the nervous system! The forebrain, where most conscious thought and sensory processing occur in the cerebrum. The midbrain, which caps the brainstem and is involved in reward/addiction. The hindbrain, where the cerebellum (used to coordinate movements) is located. The midbrain and some regions of the hindbrain make up the brainstem, which maintains many of the basic functions for life: breathing, heart rate, and swallowing, to name a few. Of course, the functions of the brain are actually much more complicated than I’ve described here; this is just a general breakdown! In the lab, the students exposed the brains of their dogfish, then compared them to sheep brains! They observed the differences in size and organization between the two, highlighting their different lifestyles and the specializations that each type of brain has undergone. For example, as a mammal, the sheep’s cerebrum is much larger than the dogfish’s, indicating an improved capability for thought! In the biomechanics portion of the course, this week focused on the different classes of levers and on the physics of walking and running! An out-of-class activity involved calculating Froude numbers (which are related to an animal’s velocity and leg length) for some of our students; along the way, we picked up a canine volunteer! Thanks, Lulu! Finishing off the week, we had a guest speaker come by! Her name is Brooke Flammang, and she works for the New Jersey Institute of Technology. Her lab studies fish and finned locomotion, and she’s helped design a robot that swims like a fish! What’s more, she actually discovered the radialis muscle found in shark tail fins! It was a great way to illustrate how Bio-Inspired Design can be put to work in the real world. Next week: The Wyss Institute Symposium on Bio-Inspired Robotics and the start of internal anatomy! 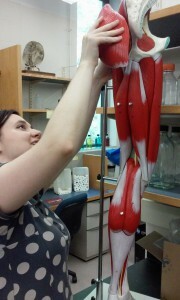 This week, the Bio-Inspired Design program tackled the muscular system! In lecture, we went over the different types of muscle tissue, muscle naming conventions, and the various functions of muscles! It turns out that they do more than just move you! Muscles also provide support for some internal organs, help regulate body temperature, and can act as a nutrient reserve in a worst-case scenario. 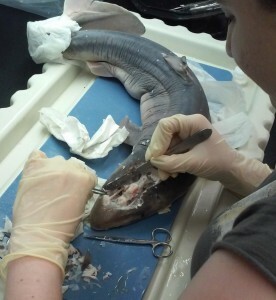 In the lab, the students exposed the muscles in cats, dogfish, and a variety of individual specimens, highlighting the changes in muscle tissue as organisms became more complex. The students also compared these specimens to a human model, showing how the musculature changed in the transition to a two-legged lifestyle. For example: the gracilis muscle, so named because it is thin and grass-like in the human leg, takes up half of the width of the inner thigh in the cat. We also covered a few more concepts in biomechanics, like Euler Bending (which causes a bend in an overall structure), local buckling (which leads to a deformation in a small region of a structure), and degrees of movement (how wide a joint’s range of motion is). The students also used a variety of pastas to examine the impact of structural changes on tensile and compressive strength! Next week: the nervous system! This week we stepped back from the microscopic side of biology and took a look from a more macroscopic point of view, starting with the skeletal system. It turns out, it’s because bone is a composite tissue! It combines the tensile strength of collagen fibers with the compressive strength of hydroxyapatite (a calcium-containing mineral). This means our bones can resist being pulled, pressed, or bent fairly well; enamel, on the other hand, is only great at resisting compression – not the best choice for supporting a body. Outside of the classroom, we took a tour of the Harvard Museum of Natural History! Each student was assigned a species on display at the museum, and they each gave presentations on their animal’s skeletal system: what made it unique and why it evolved that way. Fun fact: the male platypus is venomous! It has a small spur jutting off the heel bone in its hind legs that it can use to inject venom. In the lab, we compared the skeletons of various vertebrates from birds to sheep and a multitude in between! Comparing the form and function sheds some light on why the same bone can take on totally different shapes in different species: bat wings are modified hands, a turtle’s shell is an altered rib cage, and a bird’s breastbone is extended into a “keel” that supports the flight muscles! Coming up next week: the muscular system! 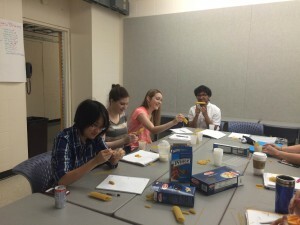 Bio-Inspired Design (BID) is off to a roaring start in the classroom, in the lab, and on off-campus trips! We started out the same way everything does out in nature, with embryological development. We learned how a single cell can multiply, migrate, and differentiate into a functioning organism; surprisingly, many hallmarks of development are conserved across vastly different species. At some point in their lives, all chordates have had gill slits – even you! We took a trip out to the Museum of Science, looking at how BID is being applied out in the world today. We saw the RoboBees, an exhibit showcasing microrobotics and the challenges in replicating swarms found in nature. They’re not quite off the ground yet, but perhaps one day these could be a solution to the disappearance of bees throughout the world. In the lab, we took a look at the four main tissue types on the microscopic level: connective, epithelial, muscle, and nervous. We tied this back to our developmental class, discussing the origins of each tissue and how to classify them. Fun fact: blood is considered a specialized form of connective tissue! Coming up, we’ll be moving into the body systems, starting with the skeleton! This week, the Health, Law, and Justice group tackled a tough but vital aspect of patient autonomy and our health care system: informed consent. We learned that it has four distinct but interconnected parts (authority, capacity, material information, and agreement) and that a lot of real-world medical disputes occur because of differences of opinion on one or more of these sections. When we examined recent ethical disputes, we found that all of our cases could be traced back to informed consent. Who should have been making decisions? Did the physician give the patient all of the information he or she needed in order to make the decision? Who was right? We will continue to examine these questions and more, so stay tuned! Posted on June 12, 2015 Author bjordanLeave a comment on HLJ tackles informed consent! 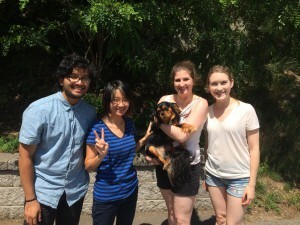 Welcome to the Justice Brandeis Semester blog! Watch this space for news and updates about our JBS programs! Posted on June 3, 2015 June 17, 2015 Author smaxwillLeave a comment on Welcome to the Justice Brandeis Semester blog!